– Not the best choice if you are thinking of monetizing your blog with ads, as you first have to have quite a fair amount of people visiting your wordpress.com blog and then can only use wordpress.com’s WordAds set-up where you would only share in what wordpress.com earns from those ads. – Your blog’s address ends in .co.za or .com like any professional website online. Do it! Start a blog! Get your domain registered and get hosting on your own, and start a blog using a free (or bought or custom designed) WordPress theme! – PLUS just get right to the starting point where all you have to do is use provided log in details to access the dashboard of your blog! Do it! Start a blog by hiring somebody to assist you! Get your own domain and correct hosting, give the hosting log in details to somebody and pay them to set up the basics of your WordPress-powered blog for you, so that after that you can just log into your site and start blogging (and maybe creating your navigation tabs etc too if the person you hired didn’t do that for you). Can browse around and can get a domain registered and can get hosting cheaply, then somebody else does the installation of WordPress for you. May be expensive to hire somebody to do the installation for you and may take a while to find somebody who will also do the basic settings and more for you too, at not too much of an extra fee. Do it! Start a blog by getting your own domain and hosting and hiring somebody to assist you with the rest! If you want to start a blog and you see website packages where you could add your own content and manage the site yourself, it is a Content Management System and you could use that website as a blog. 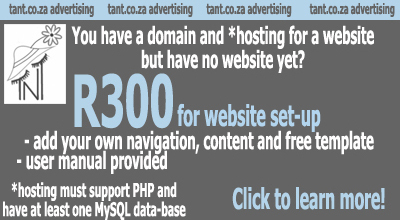 Get your own domain and hosting, give the hosting log in details to us, Terry and Tony, owners of this site, tant.co.za , and we’ll install WordPress, do some basic settings, and send you your WordPress dashboard log in details along with a user manual – for R300. We can do more than that if you like, but at more of a cost. See our website packages. – See our testimonials page, or browse around our site and see that we are down to earth, friendly, and earn a living from home in a number of different ways, including from blogging, from website design, and from setting up sites or blogs. – Can browse around and can get a domain registered and can get hosting cheaply, then we do the installation of WordPress for you. Do it! Start a blog by hiring us to assist you! Hire us to do your domain registration and get hosting for you too, in addition to installing WordPress, doing some basic settings, and sending you your WordPress dashboard log in details and user manual (R300). .co.za domain registration R120 (renewable yearly), .com domain registration R190 (renewable yearly), hosting R400 (renewable yearly) for 100meg disk space, unlimited bandwidth, unlimited professional email addresses. – All the trouble taken away from you. Just get to the point where you can use your WordPress dashboard log in details and go start playing with your blog. Also see the advantages of option 6. Do it! Start a blog by hiring us to assist you with everything! Add a WordPress-powered blog to your existing html or brochure website, if your existing site is on the right sort of hosting package needed for this (enough hosting space and supports WordPress being installed) by logging into your site’s hosting area and installing WordPress. – Free because you already have a website and will just be adding an area that you can manage yourself, and also free if you already have the correct hosting and enough disk space on that hosting. – You need to know how to (or learn how to) do quite a few things, including how to add a tab to your existing site that says “blog” or “news” if you want people who visit your existing site to also navigate their way to the blog area of your existing site. Do it! Start a blog by adding a blog to your existing site! Same as option 8, but you provide somebody or us with your website’s hosting log in details and they or we install WordPress for you. If it’s us you hire we can do it for R300 like in option 6, but if you also want us to add one text link on your existing site’s homepage that links to your blog, our price increases to R350. Do it! Start a blog by having somebody or us add a blog to your existing site! If you don’t know what kind of hosting your existing site has (or if it will support WordPress being installed) contact us telling us where your site is hosted and which hosting package of theirs your site is using, and we’d be able to tell you if that hosting would support WordPress, and if it doesn’t, can offer advice on what to do. Also feel free to contact us with other queries you may have, or have a look at our website packages page first. Want to Start a Blog? Get a Domain and Hosting from the Start! How Much Does Web Design Cost? How Much does a Website Cost?